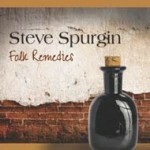 STEVE SPURGIN’S “Folk Remedies” has been released. It is now available from Elderly Instruments (Elderly.com), and copies in disc and download formats will very soon be available from CDBaby.com, Amazon.com, and other conventional retail and electronic outlets.Pre-release orders are now available from Elderly Instruments (Elderly.com), and post-release copies and downloads will soon be offered by CDBaby, Amazon.com, and many other conventional retail outlets. We recorded it at The Parlor Studio in Nashville (thanks again to engineer John Saylor for a great job), with the able assistance of Jim Hurst (guitar) and Missy Raines (upright bass). Mixing and mastering were done by Eric Uglum at New Wine Sound Studio in Apple Valley, California (thanks Eric — you went above and beyond). © 1997- Blue Night Records. All rights reserved.